The Resource View shows you all jobs and tasks in a resource-centric view but without displaying the assignment to resource groups. This can be especially useful if you have resources that are assigned to multiple groups. The design of the Resource View is based on the structure of a Gantt chart. On the left, there is a table, displaying resources and their relating tasks as table rows. 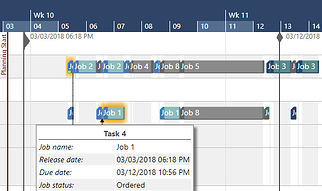 On top of the right part of the Resource View a time scale is displayed, below it the chart of your schedule shows the tasks which are assigned to the respective resources as bars. Calendar grids in white or grey indicate working (white) and non-working times (grey) of the resources. Below you will find detailed information of the Resource View's structure and its manifold ways of editing resources and tasks. The resource is displayed as table row in the table area while in the diagram area the bars, each representing one task of a specific job assigned to that resource, are arranged as chain, one row per task. Each task is shown in a single table row while in the diagram area each task of this resource is displayed as bar. The resource will be deleted. Opens the "Manage Resource Details" dialog where all the resource's details like resource name, resource group, and work time can be edited. At the same time, a small red bar appears below the corresponding task(s) in the diagram area. At the same time, a red exclamation mark appears in the table area left to the resource name.